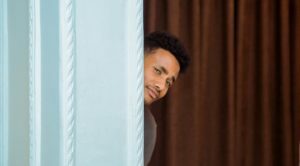 There are a lot of strategies you can use to start out, but there’s one strategy out there that is used so often as an opening strategy to build the business. Yes, so many people and companies will recommend it. If you’re on your own, this is a strategy you will likely think of. The problem is that using this strategy is not usually effective and will probably be a waste of time. 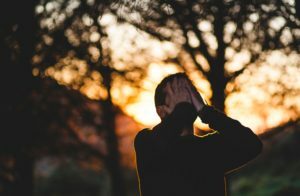 This strategy is likely to keep you stuck at ground zero, unless you’re a really, REALLY good seller and very convincing in your sales talk. The strategy? A man peers around the doorway. What’s Wrong With Going After the People I Know? Hear me out, my friend. Yes, talking to the people you know is probably the easiest thing to do when you begin your quest to a five-figure, six-figure, or even seven-figure business. Network marketing and MLM companies tell their new reps to make a list of all the people they know and then go through the entire list, calling everyone about the new opportunity. Unless one’s a veteran of the network marketing industry, he or she will probably listen to that advice and go through the entire list. Whether it’s 20, 100, 200, or 500 people, he or she will call, text, whatever means available to contact these people and ask them to buy the product or get in on the opportunity. Obviously, the longer the list, the better the chances of getting the business off the ground. Except for one little thing…………..
Any expectations of a flying start to the business takes a major hit. So, What Happens After That? If you’re in a business for the long haul, don’t spend your valuable time chasing your friends and family. Unless they’re all entrepreneurs and/or they don’t have beliefs against these opportunities, you’re just going to get yourself stuck and discouraged and it’s just not worth it. The solution is in a concept called attraction marketing. Attraction Marketing is a strategy that gets potential customers/clients attracted to you and asking about your product, service, or opportunity. That’s right, my friend, the days of pitching prospects and shoving your business in people’s faces are sailing away into the dark of night. If you have your own product, don’t come out to people talking about the benefits and features of your product. If you are an affiliate or representative of a business, don’t talk about the business right away. Am I confusing you at this point? How successful you are in online business depends on how much value you are giving to your audience. You build an audience and create leads by giving value. You build relationships with your leads by giving value. What value am I referring to? Create content that’s related to your business. This content can be made by ways of writing, audio, or video. You can use sites such as Facebook, YouTube, and LinkedIn. You can also create your own blog and website. Content that help to solve problems will be of value to those who have that problem and want to get rid of it. Lead magnets are freebies that help and/or inspire people. You offer this to your prospects in exchange for some kind of contact information, usually name and e-mail. Oh, and by the way, lead magnets can also inspire good value content. You are not chasing people with the intention to sell them something. You are giving people value to attract the leads to you with the intention to build relationships with your audience. This is the basis of attraction marketing. You get people to come to you asking about your business. 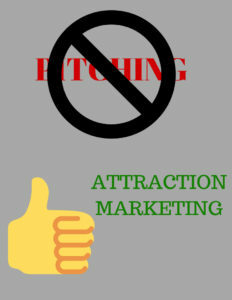 Ditch the pitch and get familiar with attraction marketing! At the end of the day, you are the one who decides how you want your business to grow. If you want this business to be a hobby, then you can just focus on getting your friends and family to join in and enjoy little success. If you want to grow a real business, you got to generate new leads that want to solve problems that your product, service, or opportunity can offer. What do you see yourself in your business? Are you chasing prospects or are you attracting them? Read about The Mindset of a Successful Business.